I'm closing out the year with a few Corn People reviews, continuing the journey we started earlier in 2018 into the Sea of Stars above and then into the depths of the ocean below. They've been doing an album each month, and I owe it to these corny weirdos to review the last few albums before the year is up. 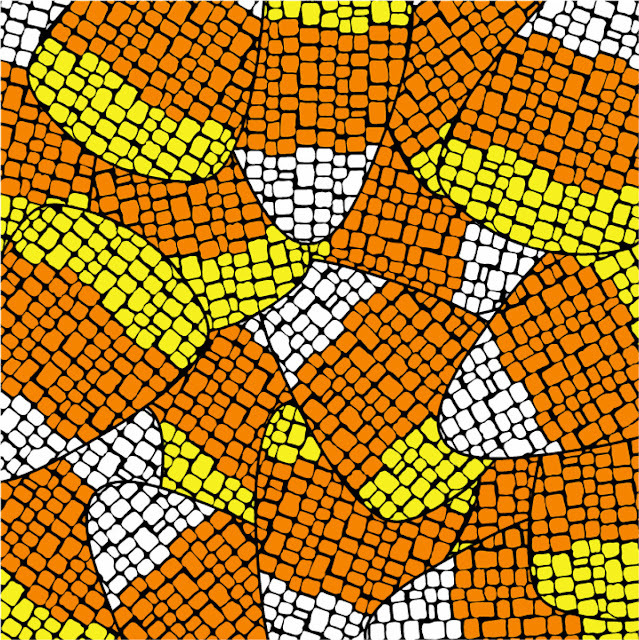 This is their October album, The (Candy) Corn People. The album cover makes great use of the standard corn texture, providing both unity and repetition to the overarching discography. I do like the use of texture and color here, though the outlines of the candies coalesce in a way that makes this a little disorganized. Overall, it works. The (Candy) Corn People by The Corn People The first track on The (Candy) Corn People, “Overture”, is awesome camp – percussive, hip-hop strings and static while the voices of the haunted descend upon man. Some rumbling footsteps lead into the next track, the motorik “Check Your Closet”. It’s a bit like Yellow Magic Orchestra meeting Kraftwerk somewhere beyond the Autobahn. The sound is light and floaty. Next is “De Dance Vampire”, something like an interpretation of musick in an old rubber hose cartoon. The song hits with heavy drums and bass, starting with a crashing speed that slows down to a swaggering swing. “Got Ya” is like a hip-hop skit, the same dark production as the first track, though the composition is all sound effects of wind and rain. One could also call it an interlude. “Corn People Scare Me” comes in with an off-kilter warble, tones that shimmer and shine off the light of the last sound. The instrumental light changes throughout. It’s a cool jam that returns to the old style Corn People jamming but makes use of a central chord progression more than some of the old stuff. The eccentricity level is still pretty high. “A Full Moon” rises into another napa-kraut jam that goes full popped weirdness. I like the production on “The Maze” as it descends deeper into the depths of the Earth. The watery synth sounds provide a melody interrupted by staccato percussive stabs. I enjoy the small chimes in the mist behind the curtain. At the end I think the cops come, and then everyone goes to “Purgatory”, a stark realm of screams and noise. Finally, the moral is revealed to be that “Monsters Aren’t Scary, They’re Just Alone”. This is a more whimsical romp through a haunted house with static effects against the rolling hills of bulbous synths and electric piano. Abbott and Costello Meet Frankenstein at last, and all is done in this story for now. The (Candy) Corn People is another great one from the mysterious Corn People. The horror interludes blend well with the fright-infused jams to make a more brisk album of solid hits this time around. The Corn People have definitely grown up since we first saw them, and I'm sure these stalks will keep going up and up. Here's to the next one (coming up in the future world of tomorrow [and I mean December 28th, 2018, not a date in the actual future world of the Blade Runners, 2019]). The (Candy) Corn People receives a Good.